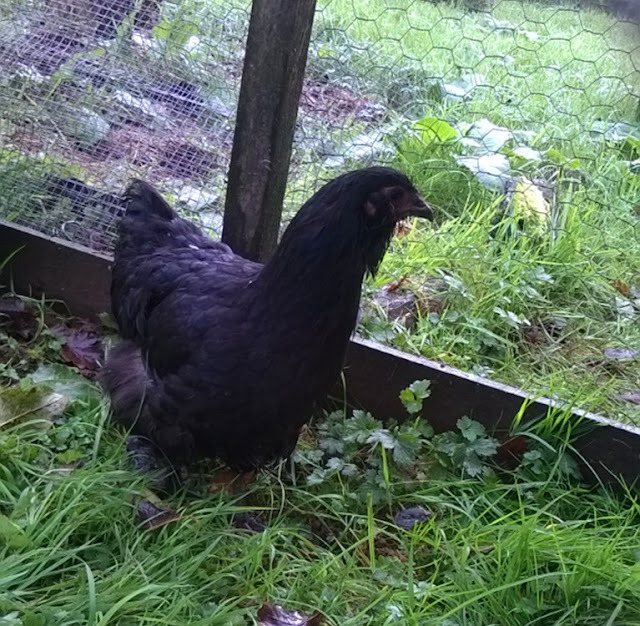 You probably remember a few weeks ago that I introduced you to my new chicken who we named Katniss Everdene. Well, this morning at 6.30am, she was re-christened Harriet, as is Harriet Houdini! At about 6.20am, Metro, my old collie decided that he needed to go out and just as I was bringing him back inside, in the pitch black, I could see a pair of eyes looking at me from the top of the fence and a what looked like a black vulture perched, waiting to pounce. Now, having just woken up I couldn't be sure whether or not I was seeing things and with my sense of self-preservation somewhat dulled by the fact I was still half asleep, I popped Metro back inside, grabbed my torch and went off to see what it was. To my astonishment it was my new chicken. She had somehow managed to escape from her house and run and was roosting on the fence looking quite bedraggled and very sorry for herself. After 15 minutes of trying everything to entice her close enough to catch her, she finally hopped into the hallway and I managed to shut the door behind her and grab her. I gave her a quick check over and once again grabbed my torch to take her back outside to her house. Although it was dark, I couldn't see any obvious way that she could have escaped and this is not the first time I have woken up to find one or more of my chickens loose on the lawn. We have a lot of foxes around here so I am always concious of their safety and although I would love to let them be totally free range, I don't think they would last very long, which is why we built them a nice big run that gets moved around often so they have lots of nice grass to scratch about on. Here is my dilemma. I actually think someone might be letting them out. I don't want to accuse anyone because I have no proof but for the life of me, I can't fathom how the chickens keep getting out. Harriet Houdini who looked suspiciously like a vulture sitting on the fence at 6.30am this morning in the pitch black!! I checked the chicken house and run in daylight and I still don't know how she escaped. I will be making extra sure that when I shut them up at night that they're well secured and I am seriously considering getting CCTV. I just don't like the idea of someone creeping around on my front lawn terrorising my chickens during the night but then again, I don't know whether I'm just overreacting. What do you think?? A sort of wildlife camera trap might be a heck of a lot cheaper than CCTV, or even a nestbox camera in the hen house? I think a camera would be a very good idea; no matter how the chickens are getting out, you will be able to see how they (or the neighbour) do it. The other thing that occurs to me is a security light that would come on when it senses movement. One of mine is aimed across the front of my property, covering any movement along the frontage. It is sensitive enough to pick up a hedgehog ambling along the path, so a wayward hen would trigger it. The angle of the lights can be adjusted, so when the pen is moved, you can still cover it. I used to have a security light but the neighbour complained it was too bright so I had to take it down. I don't mind the creeping around so much as the chickens getting out. No matter how it's happening I need to make sure they're safe. I was going to suggest a padlock too. Wouldn't cost as much as CCTV. If it isn't the neighbour you may have to consider CCTV but I think this is an expensive option. If it is her how are you going to accuse her. She sounds a bit unbalanced so I would be careful. Another option is a low voltage electric fence - might deter a clever fox, as well as the chickens, if it's at a low level but high enough so hedgehogs don't get caught.